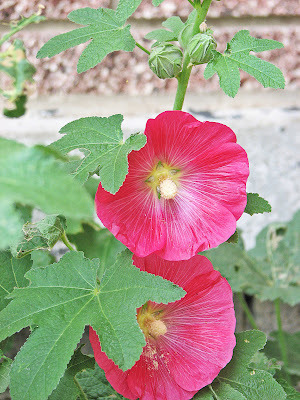 We have a bunch of hollyhocks too, but they aren't as pretty as yours, since the bugs have lunched on them a lot. Cute yo-yo! I want to see these girls purses and the rest of it. So are you using a yo-yo maker or doing it by hand? 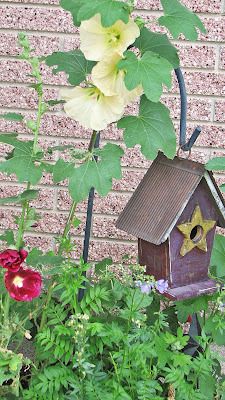 My hollyhocks didn't grow this year, maybe there's hope! 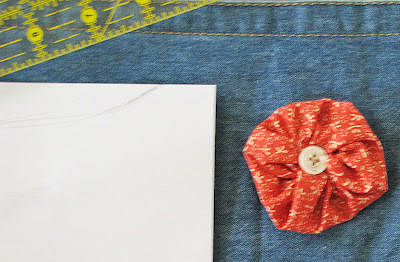 there will be an update as soon as i have something to show, but in my head they are super cute...so i have to work on it in real life now. as for the yo-yo's i'm just making it up as i go, pretty sure it's not the traditional way of making them..but when have i been traditional? The flowers are gorgeous...I'm getting sick of looking at my weeds! Well this is a comment on a very old post...but hollyhocks are a biannual plant! :-) Meaning you plant them the first year and they don't flower until the second year! The first year they are growing, but they don't send up the big stalk with a flower.